Rio Grande sophomore catcher Dylan Shockley was named the River States Conference Player of the Year during ceremonies between games at Thursday night’s RSC Baseball Tournament at VA Memorial Stadium in Chillicothe, Ohio. Shockley was also named to the RSC Gold Glove Team as the league’s top defensive catcher. 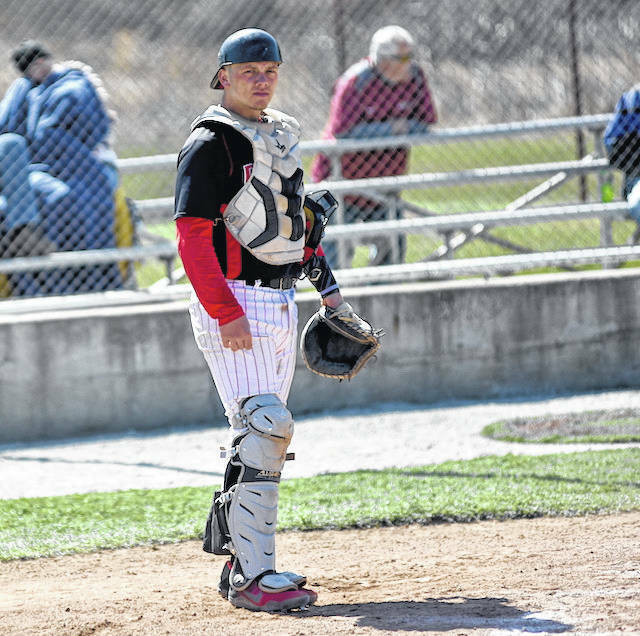 CHILLICOTHE, Ohio — University of Rio Grande sophomore catcher Dylan Shockley was named the River States Conference Player of the Year on Thursday night during a ceremony in between games of the RSC Baseball Tournament at VA Memorial Stadium. Shockley, a native of Minford, Ohio, entered the tournament hitting a team-best .382 with four homers, 38 runs batted in and 68 hits in 50 games for the third-seeded RedStorm. The All-RSC Baseball Teams and Awards were voted on by the league’s 10 head coaches. The All-RSC First and Second Teams included 17 players with four starting pitchers, one relief pitcher, two catchers, four infielders, four outfielders, a designated hitter and a utility player on each. The Gold Glove team featured the top defensive player at each of the nine positions and the Champions of Character Team had one player from each team who best represents NAIA Champions of Character. Shockley was one of three Rio Grande players named to the All-RSC first team — joining senior second baseman Juan Cruz (Juana Diaz, P.R.) and junior outfielder David Rodriguez (Santo Domingo, P.R.) — while also earning a spot on the league’s Gold Glove Team as one of the its top defensive players. The RedStorm placed two other players — junior pitcher Zach Harvey (Kenova, WV) and senior pitcher Osvaldo Duran (Guayanilla, P.R.) — on the All-RSC second team, while senior first baseman Cody Blackburn (Amanda, OH) and senior left fielder Ty Warnimont (Rio Grande, OH) were also named to the Gold Glove Team. Warnimont was Rio’s representative on the league’s Champions of Character Team. Indiana University Kokomo’s Renton Poole was named the conference Pitcher of the Year, Midway University’s Graeham Luttor earned Freshman of the Year honors and Indiana University Southeast’s Ben Reel was named the conference Coach of the Year. Poole, a junior right-hander, entered the tournament with a record of 6-2 with a 2.12 earned run average in 13 outings. He held opponents to a batting average of just .188 and racked up 86 strikeouts in 68.0 innings. Poole was one of four starting pitchers on the All-RSC First Team. Luttor entered the postseason hitting .336 with six home runs and 42 RBIs in 38 games. He made the All-RSC Second Team at first base. Reel led the Grenadiers to a record of 38-10 overall and 23-4 in conference play to win the regular-season championship in the league. IU Southeast locked up an automatic bid to the NAIA Baseball National Championship Opening Round with that title. Point Park led the all-conference teams with 11 players named overall with six on the first team and five on the second team. IU Southeast had five on the first team. IU Kokomo put four players on the second team.